A lady collecting for those in need below. At ‪Christmas Square in Melbourne below - lots of colours, elves, antlers and people. Enjoying a cup of chocolate at Koko Black in Royal Arcade - taking a break from Christmas shopping. 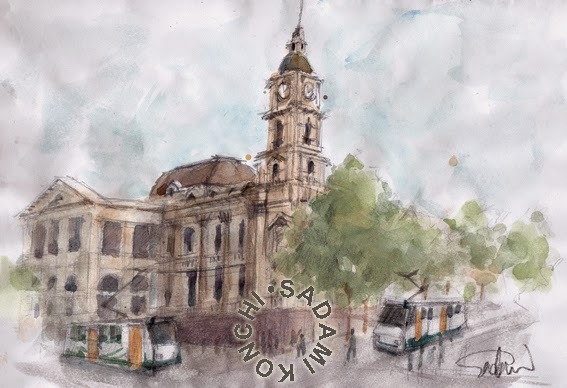 Fellow USK, Lisa Foong and I met up last Saturday to go to the Finders Keepers markets but also planned to do some sketching as well. The Aust Tech Park (ATP) is located right next to Redfern Station and in its former life was the Railway yards for Sydney trains. 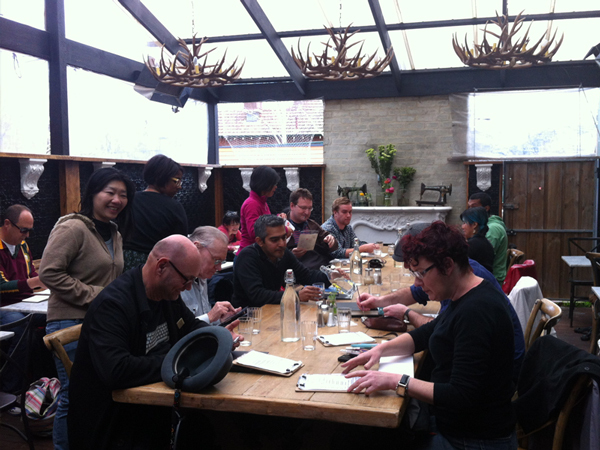 For those who watched the Sydney based series of Master Chef that is where it is filmed. The big old wonderful bricked building have found another lease on life as a convention centre, with smaller IT research organisations seeming to have office space there as well. 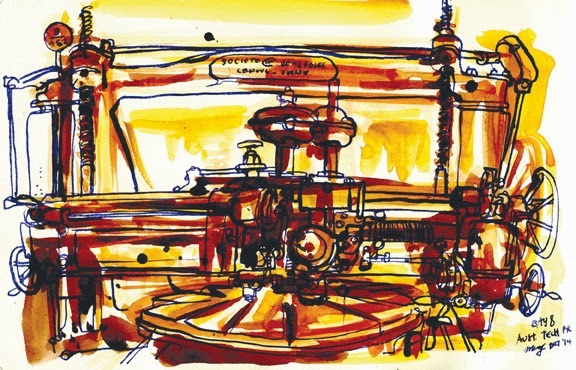 Like Cockatoo Island a lot of the heavy machinery is still there, pride of place for everyone to enjoy, especially us sketchers. I don't know why I love drawing them so much. Plus there was an old red rattler carriage on display outside as well. We had a peek inside one of the buildings which seemed to be the old metalworks area. It looked like a section of it was still in use but the rest housed all the old tools and machinery. It was locked but the security guard did say it was open to the public during the week, and in a few months time it will be open on weekends too! How exciting for us sketchers. Hi, Friends, I spent time with Australian prominent illustrators, authors, publishers and agencies at John Barrow Collection organised by the mentor Ann James in Melbourne. It displayed the priceless original illustrations and illustrators' work processes. It was amazing to see the originals in my own eyes and compared them to picture books set at originals. I've learned lot. Great fun to meet super stars in person such as Leigh Hobbs, Gabrielle Wang, Jane Tanner, Craig Smith etc, etc, oh, too many to write them up. Some people who could not join ask Ann to have it again in next Feb. Sweet editor/publisher Helen Chamberlin took me to a cafe and we enjoyed a chat. Very supportive Helen introduced me to others. I really appreciate many people's support. A next day, Monday, Ann and Helen were invited to Prime Minister Literary Awards 2014 in the evening. Helen accompanied Shaun Tan. (*Yes, Helen has nurtured Shaun and gave him a debut chance in children picture books.) In a Children's fiction section, Bob Graham's picture book, "Silver Buttons" won! 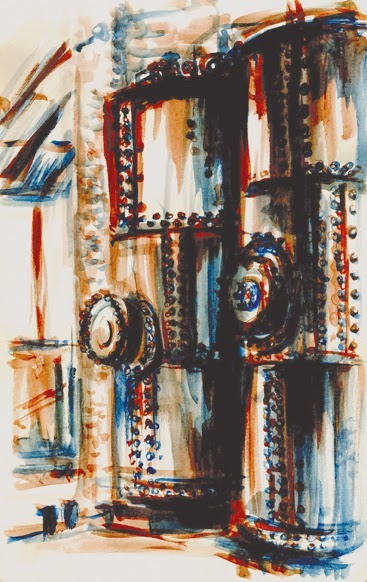 I love Bob's work and admire him! Bob donated his winnings to refugees! What a marvelous coincidence! 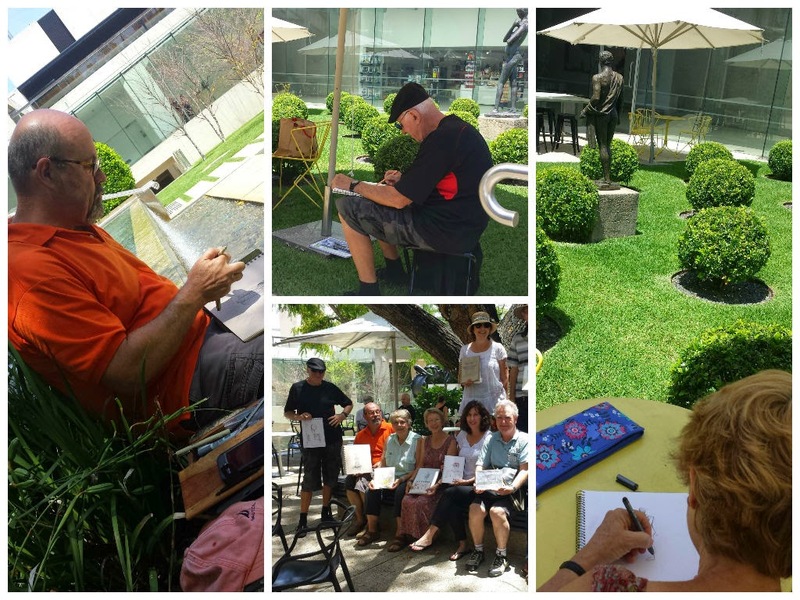 Ann James organised Bob's exhibition in Canberra in the past June last year. We celebrated Bob's win. I'm very happy to work with such a fantastic mentor and to be surrounded by humanistic illustrators who have a big heart and passion for social justice. 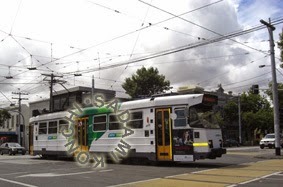 "Melbourne Town Hall and Trams"
In Melbourne, trams are cute and singing "ting, ting" always. Btw, it's much cooler in Melbourne than in Sydney. In Sydney, I do not need any long sleeves right now in summer. But in Melbourne, a light overcoat or a jacket are essential. How come? Beside a cool temperature, a weather is changing dramatically there. It is called, "Four seasons are in a day," brrrrr! 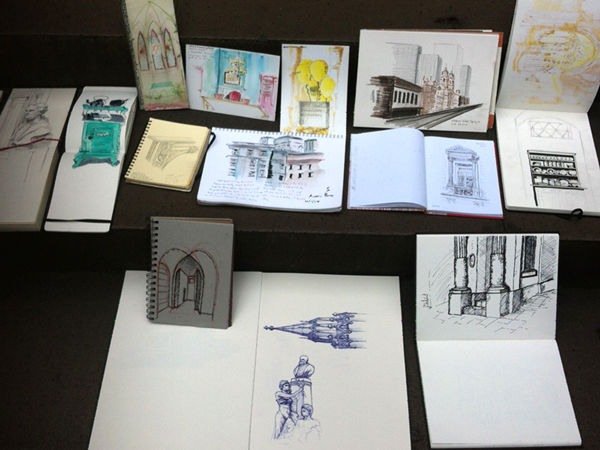 I luckily sketched architectures in sunshine. 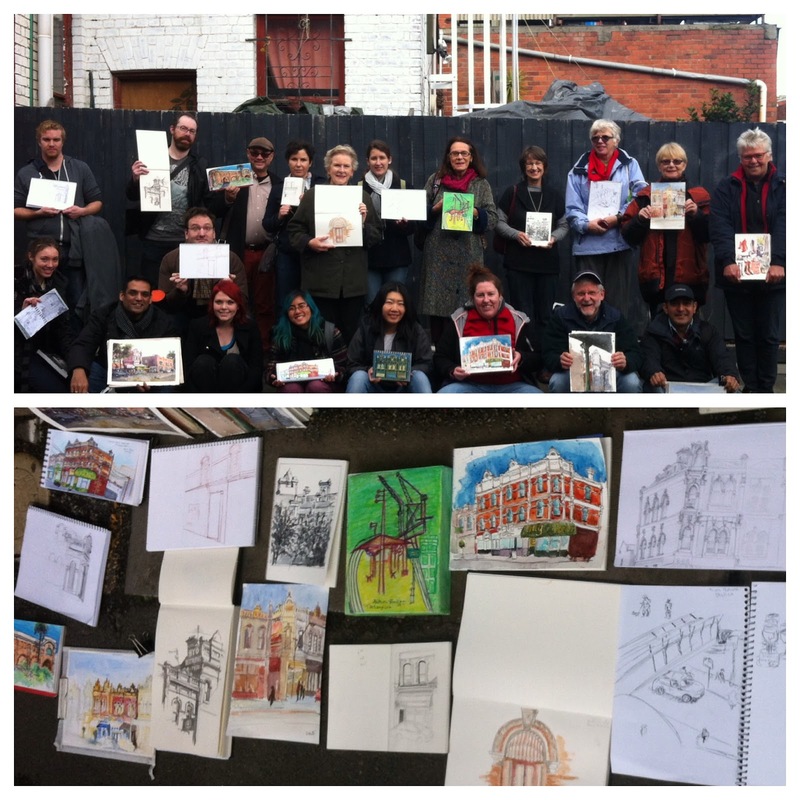 One more, I'd write about the wonderful volunteer spirit in Melbourne! (Sydney does not have them on main streets.) When you get lost on streets what/whenever, find people in red uniforms. They happily help you! 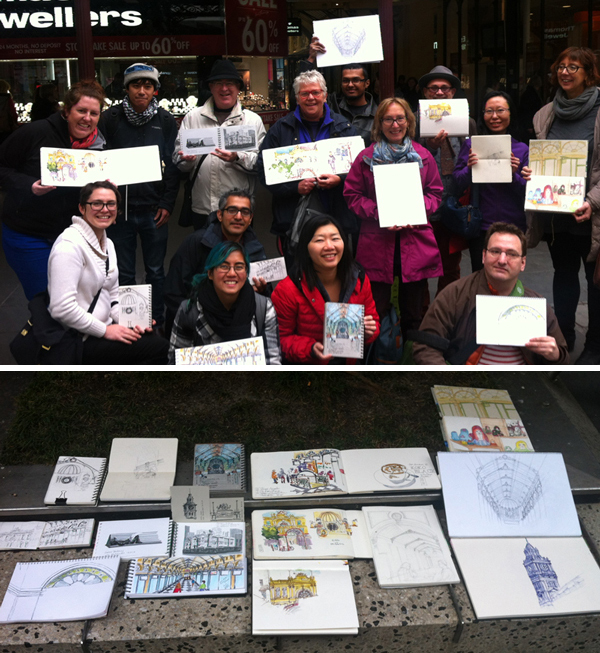 Volunteers love Melbourne! Thank you for people in Melbourne. You gave me a wonderful memory and heart warming time there. Now, I'll work on ongoing projects and portraits. 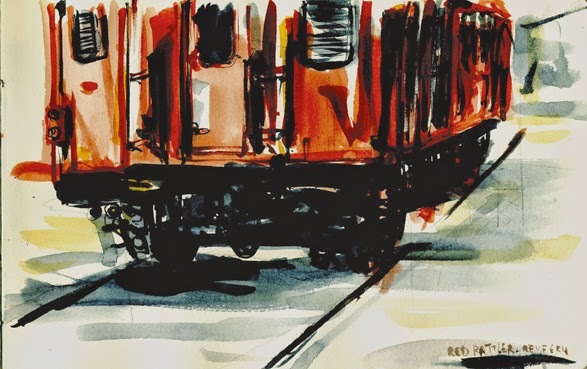 The show goes on till Dec 6 at Town Hall Gallery. 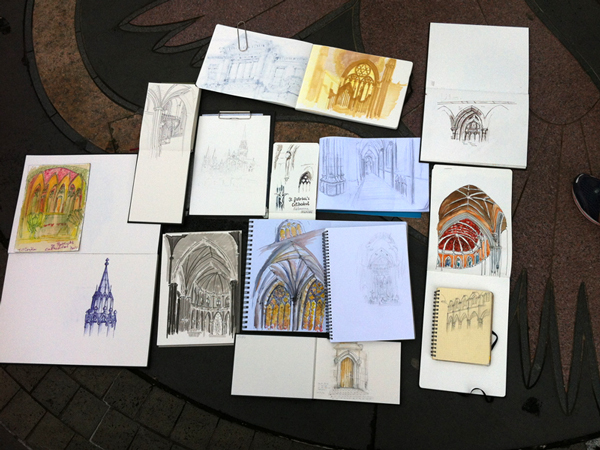 Great month sketching............... 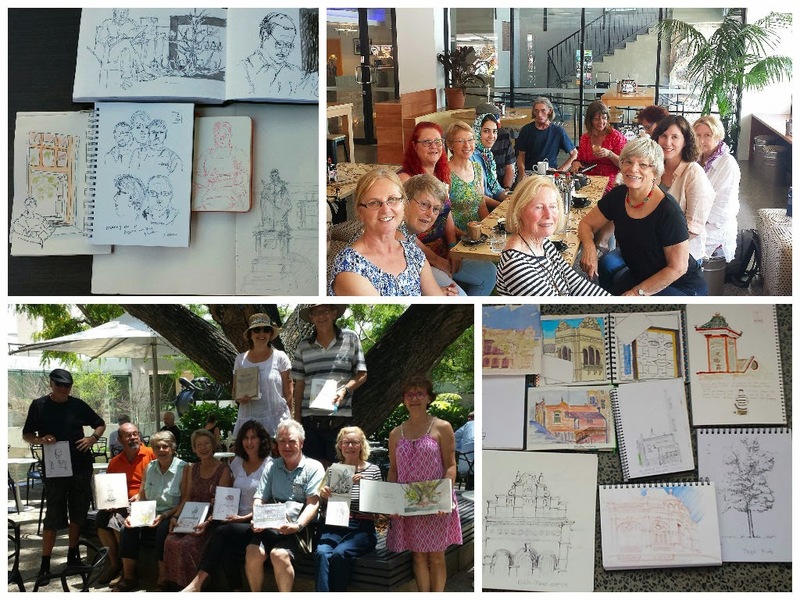 If you want to join us, please click on this link..URBAN SKETCHERS BRISBANE We have a FLICKR Group too for members who don't "do" Facebook. We are not letting the G20 stop us from getting out and about in November. Check the links to check our events. This Sunday, is University of Queensland at St Lucia. Hop to see you there. 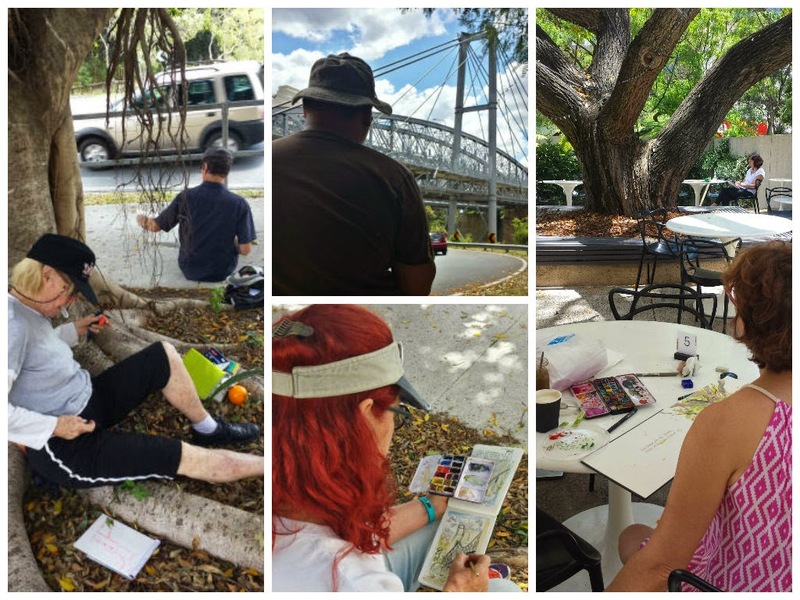 A perfect morning yesterday, after the heat of the day before: sunny but breezy, and lots of interesting vistas to paint and draw! The Palisade Hotel has been described as a ‘venerable old neck oilery’. Great expression! 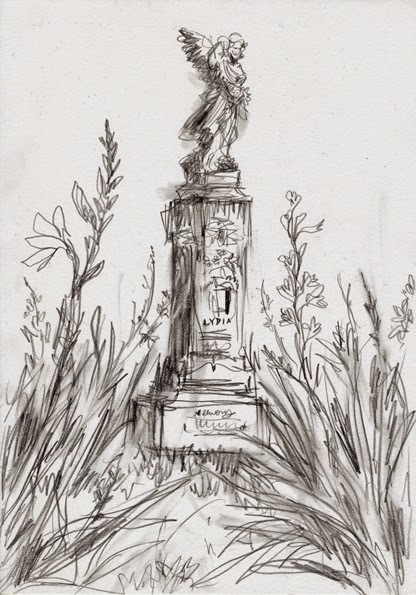 It was fitting that we sketched around there yesterday on the day that celebrations were taking place in Albany, WA, to commemorate 100 years since the boarding of the first convoy of Australian troops bound for war, as apparently The Palisade was where many of Sydney's Anzacs downed their last beers before boarding ships bound for Gallipoli! 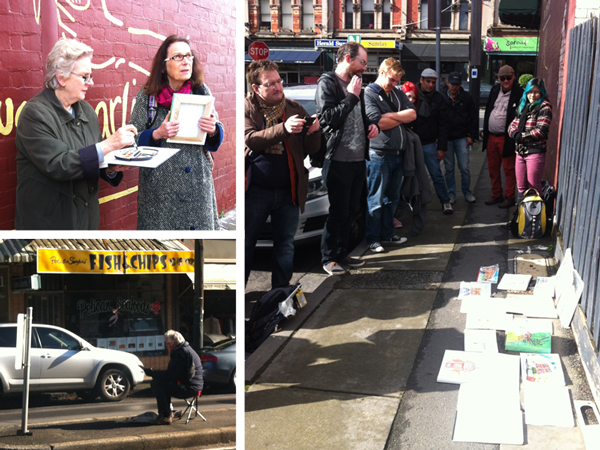 With over 20 Melbourne sketchers soaking up the sun in Hawthorn, we were set for a good day. 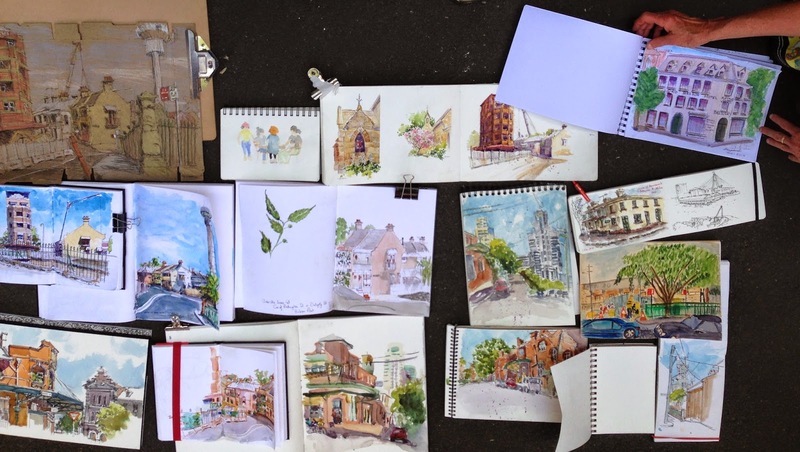 There is so much to sketch on Glenferrie Road as its a hub for shopping, cafes and Swinburne university. 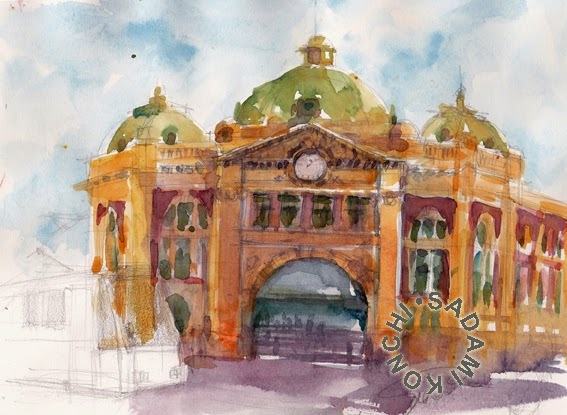 We are having a group exhibition of Boroondara in Nov at the Hawthorn Art Centre. 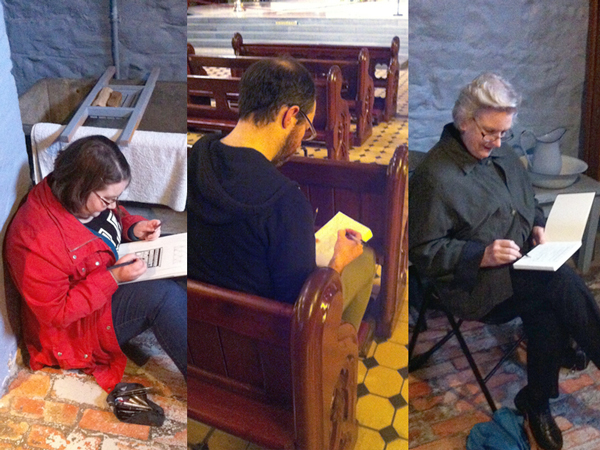 So everyone was keen to get some solid sketching in. We managed to replenish at Once a Tailor which had a big (kind of a secret) room out the back. With an early start Angela and I found a VW parked on Burwood Road. 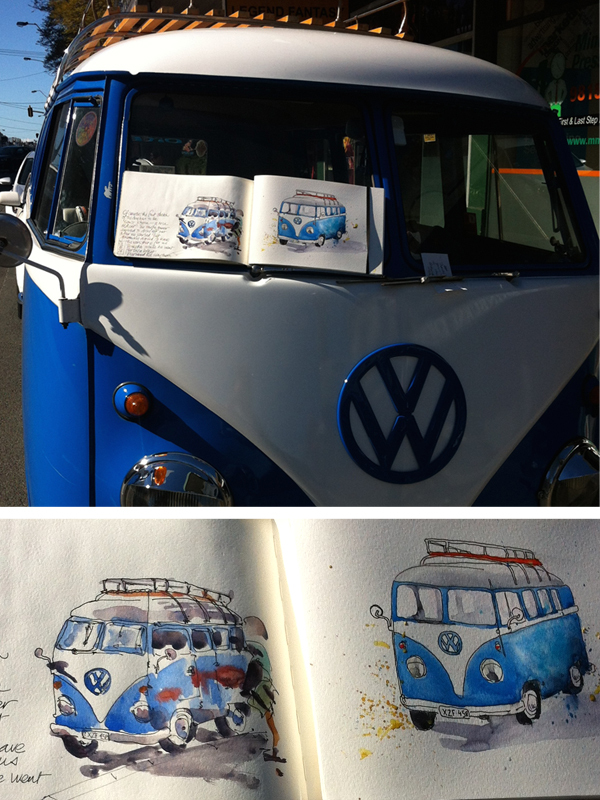 We met the owner of the van and he said he would walk to the cafe so we could finish sketching it. We sent him a scan of our sketches as a thank you. It had cool crochet rugs on the seats. 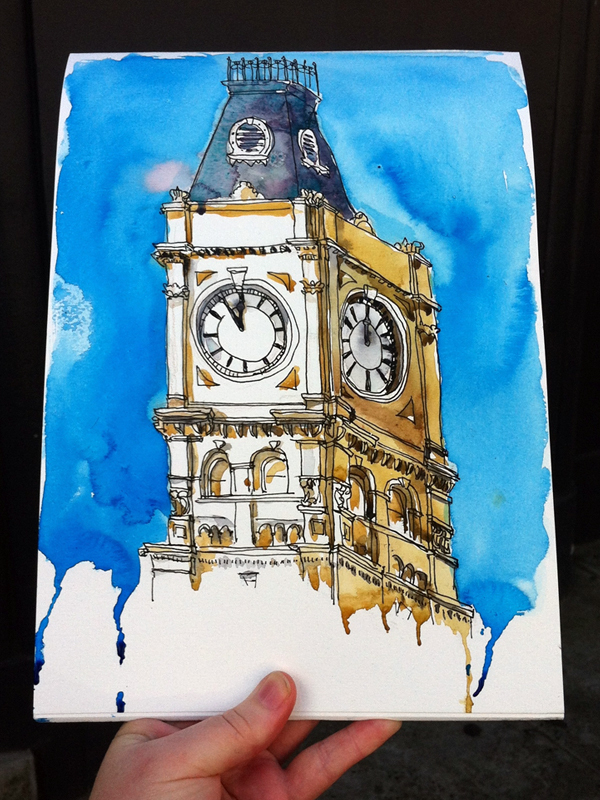 I decided to sketch the Hawthorn Town Hall with its giant clock faces. It has the different times that I was sketching the hands. I have heard people do one for when they start the sketch and another when they finish. 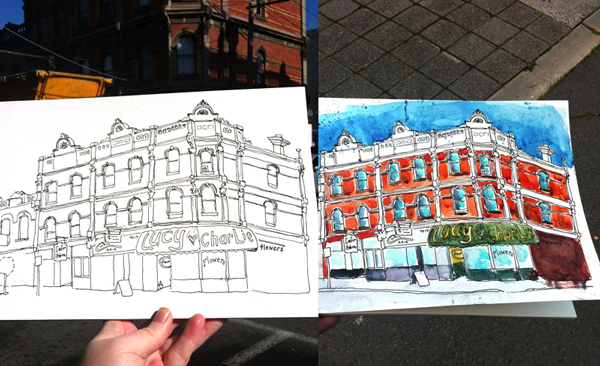 After lunch I sat out the front of the laundro-mat and sketched the top of the buildings along Glenferrie Road. I got a few people come to chat. 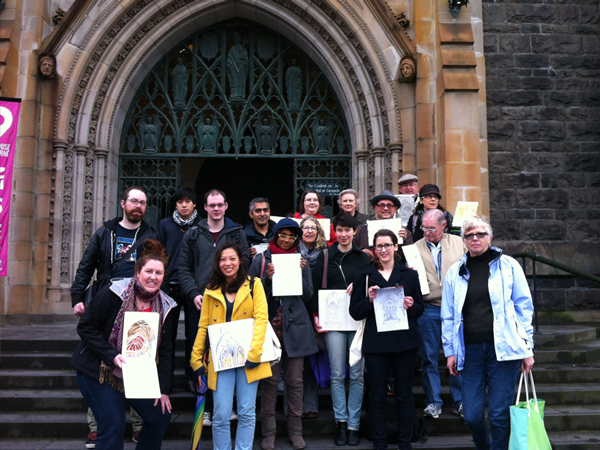 Melbourne USK Sketchcrawl at the University of Melbourne – first sketch over breakfast. The university was quite quiet since it was a Saturday. Lots of heritage buildings here. 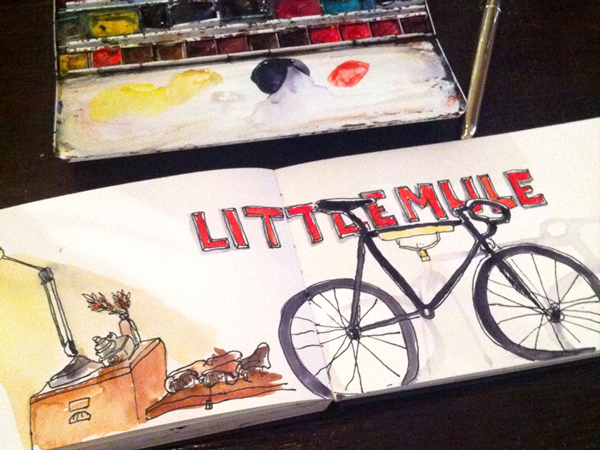 A red Vespa and her little cousin, a red push bike :) – surely I had to sketch them. Every year Open House in Melbourne allows the public to see buildings that you otherwise might not have the chance. They even have a ballot to get into the most exclusive ones. For alot of they have limits of the group size and long lines. 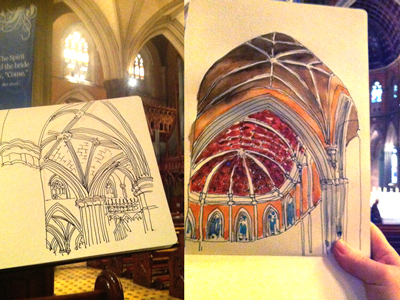 We managed to find a treasure in St Patricks Cathedral. It was warm, with beautiful lighting and lots of seats. Then we went to the Old Treasury building (you can access throughout the year). We found little hidey holes or lent against the walls. The inside is really amazing with the soft lighting and pillars. “Zombies” gathered at the Treasury Gardens a couple of weeks ago. 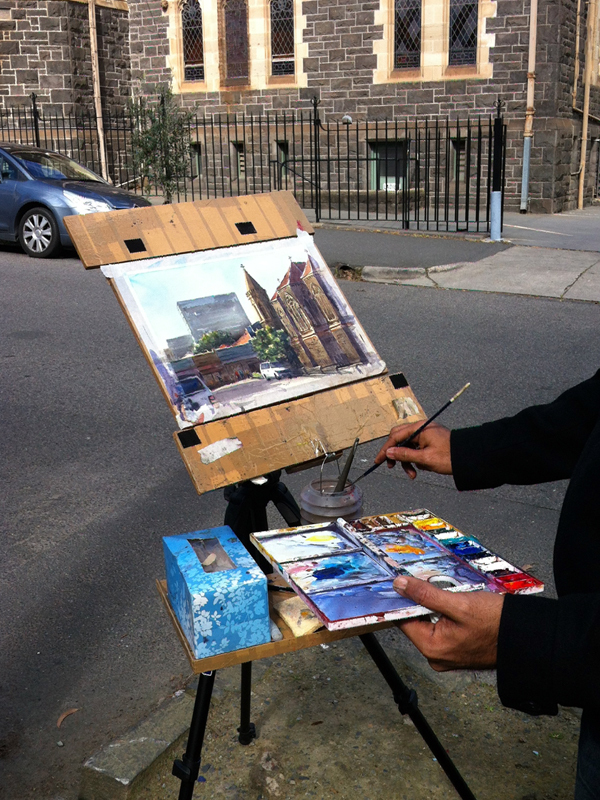 It was a great opportunity to draw as the sun was out and it was a beautiful day. 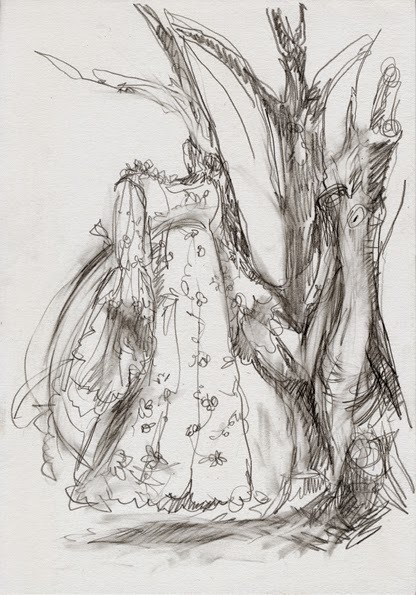 I did not manage to get many zombies in my sketch so I got 2 of them to hold my sketchbook. 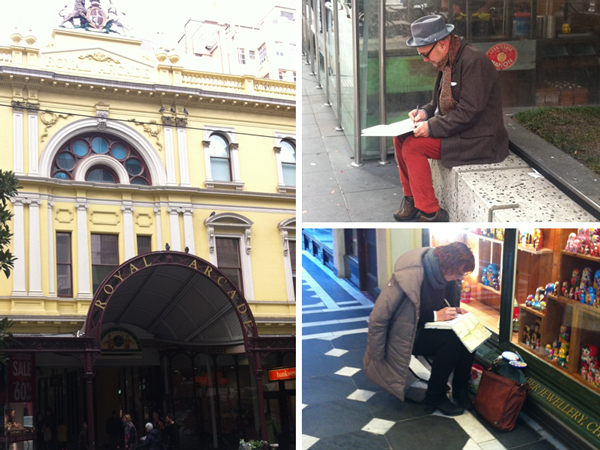 Such a fun day to sketch and to people watch. I live just 5 mins drive away from Auburn Rd, but I'd never really been down there. 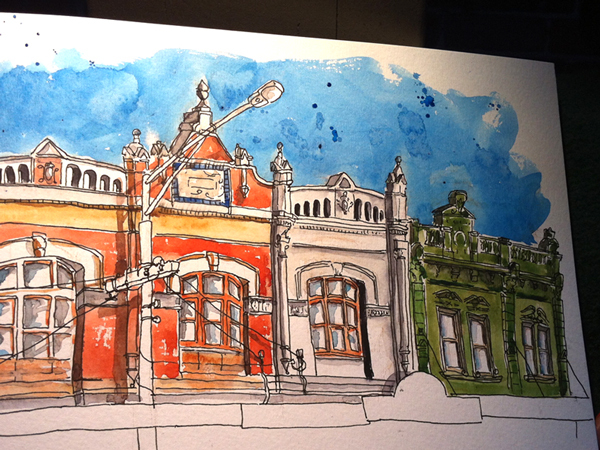 The small village of shops in Hawthorn is a treat to draw: from the heritage buildings to the cute shop fronts. Lucy loves Charlie is a florist which stands out. It's certainly a complex but lovely heritage building. 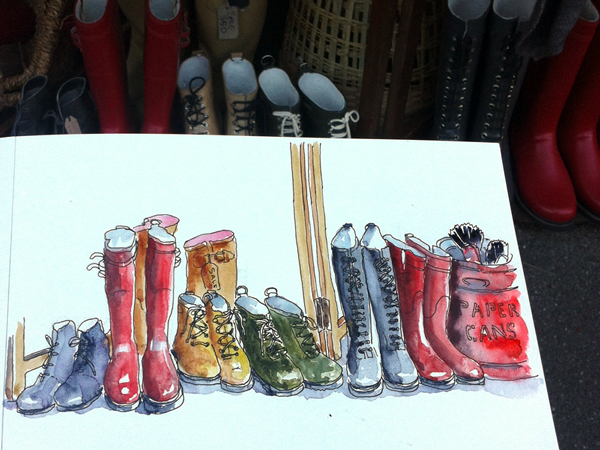 Then Angela pointed out a shop front of shoes and I was hooked. 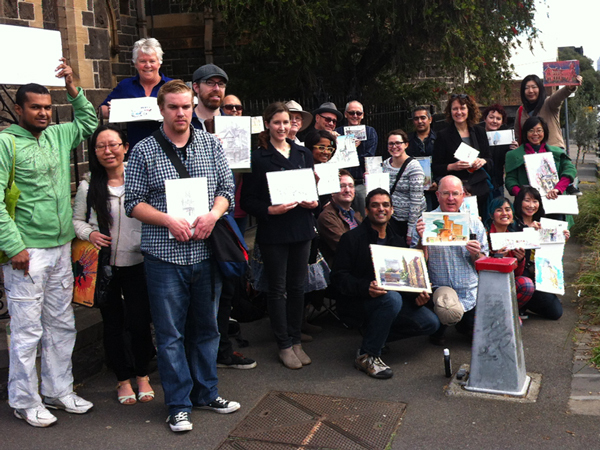 We seem to be having a run of beautiful sunny Saturdays, perfect for our sketch meetups. Last Saturday I went to Rookwood Cemetery as they run an annual installation art exhibition called Hidden. 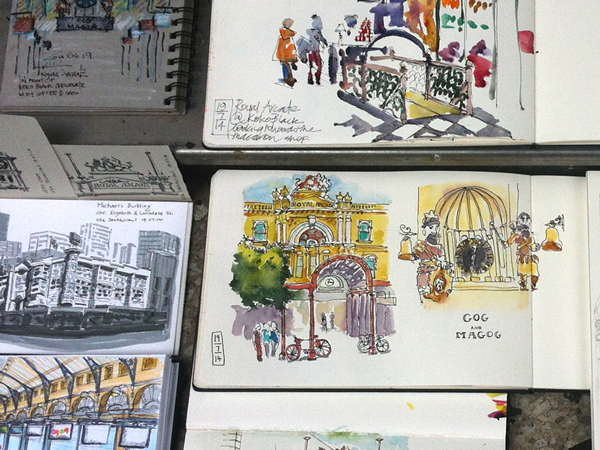 But any excuse to take a trip out there to sketch is never turned down. 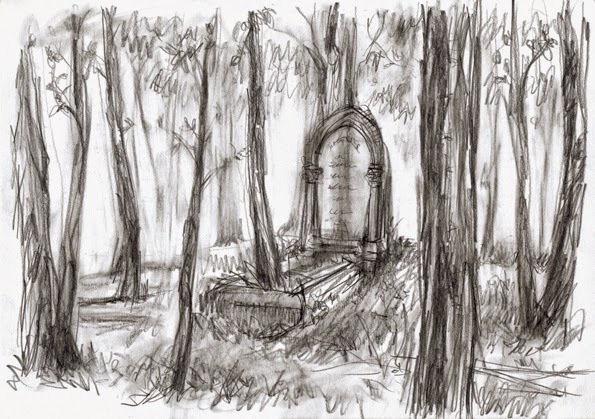 Call me strange but I do love sketching in old cemeteries. It's not that they're creepy, in fact if you get a really nice spring day, like what I had, its an incredibly peaceful and beautiful surround to sketch in. I usually have a tackle box full of watercolours and colour inks when I draw on location, but lately I have started to enjoy using graphite pencils (3B, 4B) and using a rubber/eraser as a drawing tool as well. So I would draw a bit, rub out a bit (quite aggressively and leave all the smudges in there), draw again, rub etc until I felt it was finished. Its such fun when being messy is part of your technique! 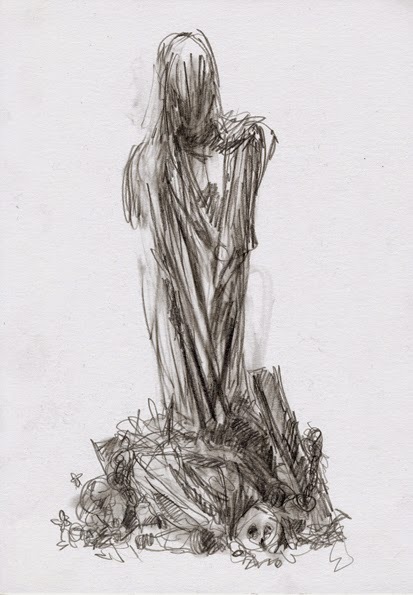 If you would like to see more drawings from this day, please visit my blog. Hi, Friends, I enjoyed a first swim at Narrabeen beach and re-read "Gift from the Sea" written by Anne Morrow Lindbergh. I've loved that book since my late twenties. Her insightful writing always gives me what a woman's life is at each stage from youth to aging, regarding relationship, marriage, creative activities and solitude in a modern society. Anne's very frank and unsentimental eye on herself and topics are very touching -- as if we were having a conversation in person. Young readers will find advice on marriage and love in Anne's comparing the shapes of shells to women's life stages. Middle aged readers will find comfort and suggestion in the maturing process of life. Aged people will find a direction to go both outward and inner world. Now, this is my first sketch of the sea. 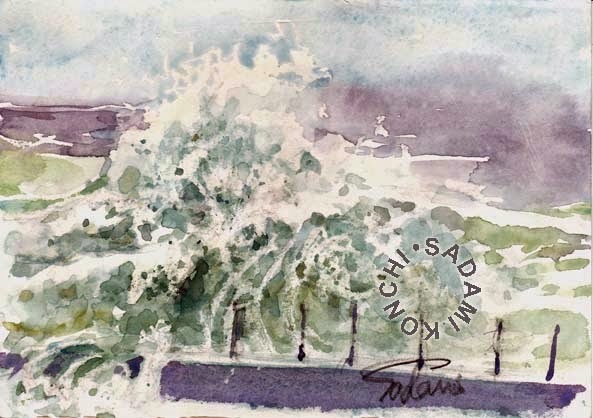 I play with waves on paper as well as in water! 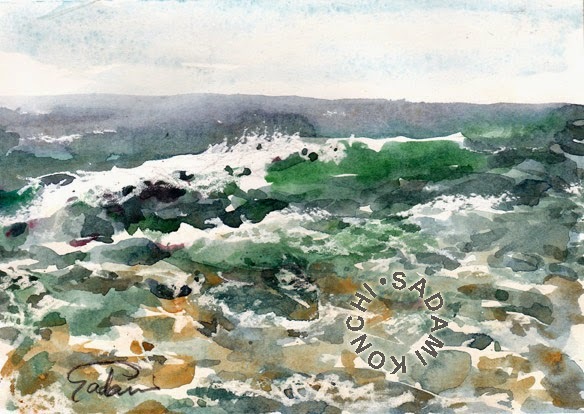 The fresh green of a big wave attracted me. Big waves in Narrabeen beach are popular among surfers. Always waves capture my heart. Its colours, movements and shapes are changing or waves never stay the same. It is much like our lives. I made this sketch around noon. 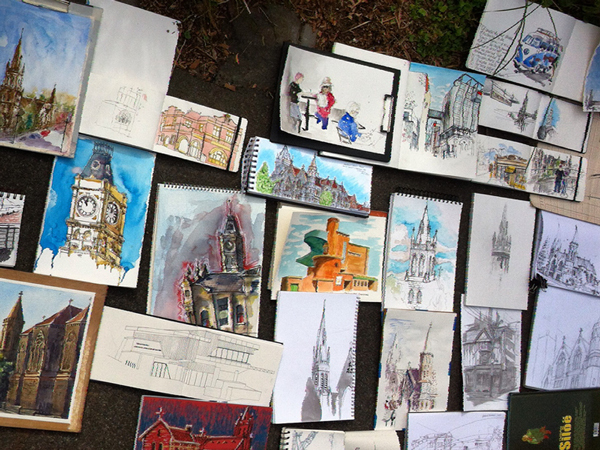 Fortunately, the weather was good and the watercolour painting relatively got dried well. Today, I did not collect any shell. (*Usually, I pick up some shells.) Like Anne Morrow Lindbergh writes, I know we cannot collect all shells -- we all, one day, clearly realise the limitation of abilities and time given on the earth. But it is the beauty of maturing ; know what we are well and properly. So, we can concentrate on what we want/need to do. This paradox is true, I feel, if we go any direction in the limitation, we can find eternity and no restriction. People enjoyed swimming, surfing, sun tanning or just walking on the beach. A water temperature was a bit cold, 18'C. Often people said to me, "You're brave!" Only a first step was cold. Once, you jump in a pool, that's fine. An ocean, like a mother, kindly held me, water was not cold at all. Few people were in the pool and almost mine early in the morning! Big waves broke against the walls of the pool and made splashes! Some came into the pool. That's very impressive, but hard to capture it. Anyway, this is my try. I hope you can hear waves and the sounds from the sea. 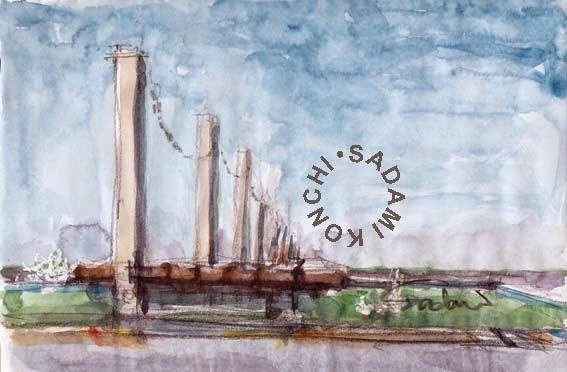 Then, the below is the sketch of the pool. A day time saving has started from this Sunday. We are getting into summer. Our long weekend was over. Each of us will go back to routine from tomorrow. But it was lovely to have had such a rich quiet time in the off days. I feel like reading well that book, "Gift From the Sea." Quite a thin book, yet it's full of wisdom in lyrical and rhythmical sentences like waves sounds. If you have a spare time, it's worth reading.